Every week, Shelf Life sees Tom White select and talk about a movie that lives on his DVD shelf, one he thinks we should all see. A huge part of the cinematic landscape from the 30's to the 60's, creature features started to become incredibly scare in the 1980's, disappearing completely by the end of that particular decade, and just becoming a blip on the radar every couple of years. Some of the more famous examples of the genre, namely King Kong and Godzilla, have endured to this day, but the rest have been lost to the ages, living on only in bargain bins and late night t.v. But as much as I love this particular sub genre, for me it's crown jewel came in 1990, billed as a throwback the creature feature's 1950's heyday. I am, of course, talking about Tremors. Our setting is Perfection, Nevada, an small ex-mining town surrounded by nothing but desert for miles to see. The perfect target then for the movies' monster of choice, giant tunneling worms (named Graboids by genre superstar of the 80's and 90's Victor Wong) who emerge from the ground to feed on the town's residents, including handy men Valentine (Kevin Bacon, who later admitted he felt the movie was a career low at the time) and Earl (Fred Ward). 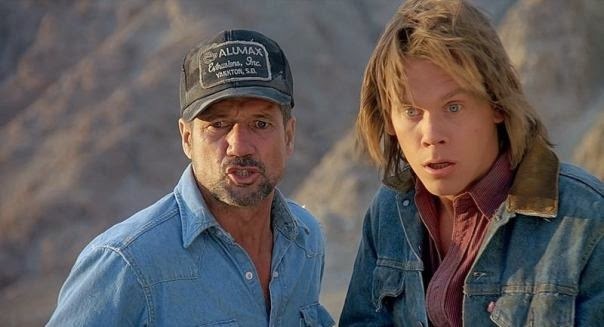 What works so well about Tremors is that it is the perfect slow burn. The Graboids (you come up with a better name) are kept pretty much hidden for the first and the first half of the second act. Think the early attacks in Jaws, swap out water for sand, and you're on the right track. Tremors moves forward with a great energy, and director Ron Underwood's love for the genre he finds himself is easy to see from the off. It embraces every cheesy cliche with open arms, but isn't afraid to make fun of it self. Case in point is, in a nod to b-movies over reliance on a scientist character to explain what's going on, Finn Carter's graduate student's growing annoyance at people's expectations that she knows everything about the Graboids, just because she's a 'scientist'. For a movie made at the start of the 90's, the effects are absolutely spectacular. The design of the Graboids, basically a gaping maw filled with squirming tentacles, captures the b-movie sensibilities perfectly, and the fact that everything is practical just adds to the charm. 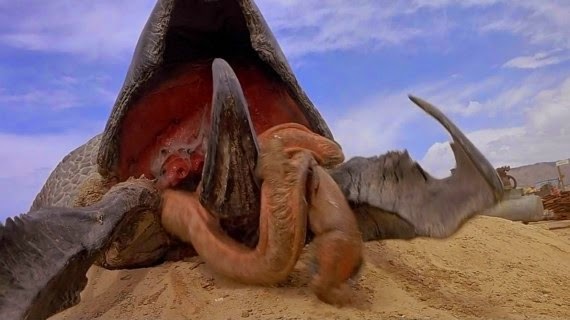 Once we see our first Graboid in the light of day, Tremors kicks into high gear as Perfection comes under siege, packing in all the over the top, gruesome deaths that was missing from earlier. The slow burn pays off incredibly well, as now that everything has been laid out for us, we can just sit back and enjoy the destruction as our extended family of heroes, with Micheal Gross and Reba McEntire's survivalist couple easily stealing the show, go to great lengths to survive. Tremors was a modest box office hit on its release, but became a massive hit on home video and t.v. It's cult status gave rise to three increasingly lacklustre sequels, and a t.v. show I haven't even thought of inflicting on myself. If Bacon thought Tremors was a career low, Michael Gross must have thought the exact opposite, reprising the role of Burt Gummer in Tremors 2: Aftershock, Tremors 3: Back to Perfection, and the t.v. show, and portraying the characters ancestor Hiram Gummer in prequel Tremors 4: The Legend Begins. But cast thoughts of sequels and spin-offs out of your head, and put the original and best on your shelf, a solidly entertaining throwback to a sadly lost genre.